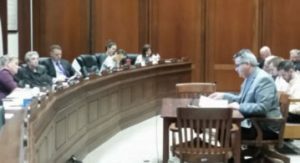 As Suffolk Downs prepares for its final weekend of racing in 2017 and looks ahead to its final season in 2018, state legislators and racing industry officials met in a hearing room at the Statehouse on September 19 to ponder the question: What’s next? The Legislature’s Joint Committee on Consumer Protection and Professional Licensure took testimony from a range of interested parties, including the New England Horsemen’s Benevolent and Protective Association and the Massachusetts Gaming Commission. The MGC has been pressing legislation for several years that would bring the horse racing industry and its various sources of revenue more directly under MGC control. The Commission drafted legislation to that effect and the committee heard testimony on House Bill 9. 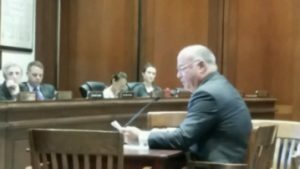 MGC Chairman Stephen Crosby testified that in order for the Commission to secure the future of the racing industry in Massachusetts it would have to have complete regulatory control over the industry and control of related revenues. Testifying for Horsemen was Paul Umbrello, Executive Director of the NEHBPA, who agreed with the MGC contention that the state’s racing statutes needed to be updated and modernized, but Mr. Umbrello said there also needed to be language in the legislation that protects the long-term interest of horse owners, breeders, trainers the hundreds of employees within the industry whose value has been on display with the extended racing calendar this season at Suffolk Downs, including bookeeping staff, food and beverage workers, wait staff, track crew and maintenance employees. The NEHBPA will submit formal written testimony to the committee to be considered as it begins to deliberate the final form of the legislation. The Suffolk meet has also been popular for local thoroughbred horse owners, breeders and trainers who are able to run their horses locally with the opportunity to compete for $1.8 million dollars in purses at a festive atmosphere where daily attendance reached as many as 8,000. We want to thank those who came out and participated and we look forward to your continued support. With the support of the Massachusetts Gaming Commission and Suffolk Downs, we were able to increase this year’s racing from 6 days to 8 days. Don’t Forget to Join Us at Suffolk Downs September 30 and October 1! Interest in the proposed Horse Park continues to grow. We have three sites under consideration, including the site in Spencer that we have already disclosed, and two sites in Central Massachusetts. All three of these sites would accommodate a 400-acre park easily accessible. We are completing a comprehensive Business Plan that includes a feasibility study, land studies, and letters of intent and non-opposition from the towns and landowners where we are negotiating. The Plan will include sources of revenue that would be generated from live racing and related site activities including competitive equine events. The Horse Park would create up to 1,000 jobs and nearly $100 million annually in revenue and taxes. We are delaying the NEHBPA board election now on the advice of Counsel and support from National because of the special circumstances we are facing. More information to follow. Please return your membership form so we can make sure we have your current membership information on file.